A dramatic landscape reflects the natural history and ecology of the site and the unique vision of its owner and curator. There is a story at every turn. 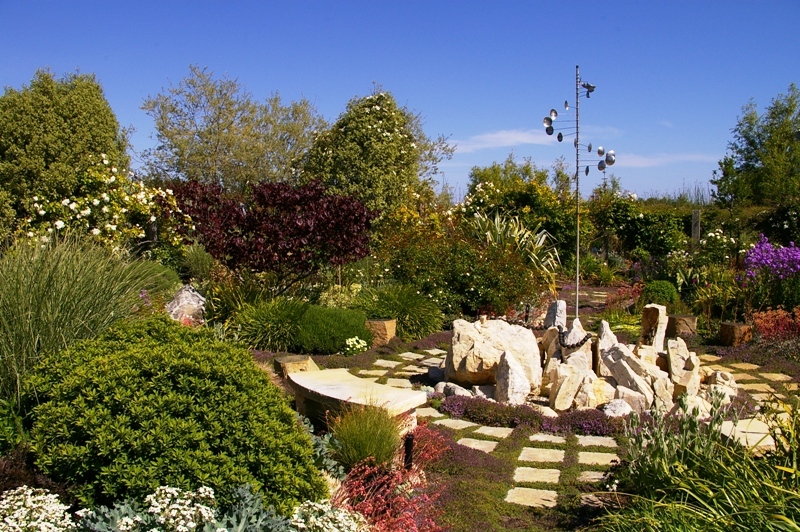 Perched high on a bluff overlooking the Pacific Ocean about five miles north of Santa Cruz, Laguna Ranch is home to a stunning collection of gardens sited within its 400 acres. Developed over the course of the past 20 years, this assemblage of landscapes reflects the natural history and ecology of the site as well as the unique vision of its owner and curator, Stephanie Mills. Mills purchased the ranch in 1991. The first structure, a log cabin, was built in 1992 and used as the family home while the rest of the ranch buildings and main residence were being constructed. 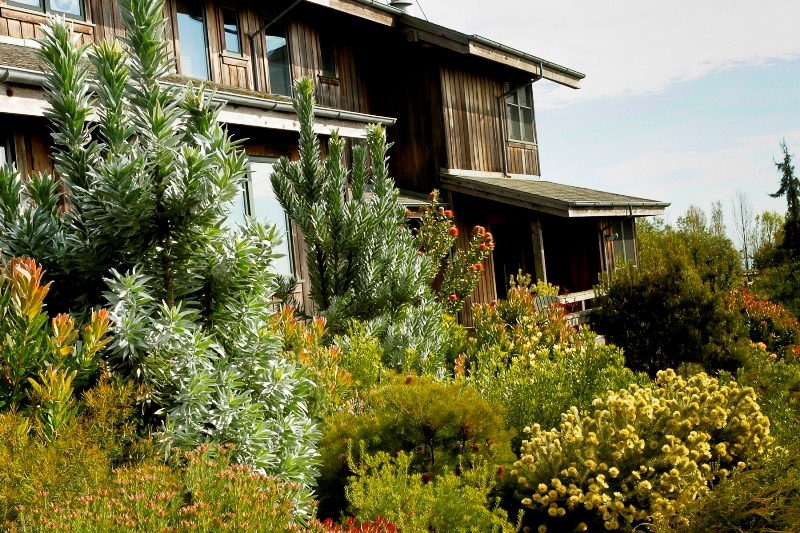 Today, diverse and inspiring gardens spread out over nearly 10 acres around the ranch compound. The property contains very distinct growing ecologies as it unfolds over three gently sloping marine terraces. 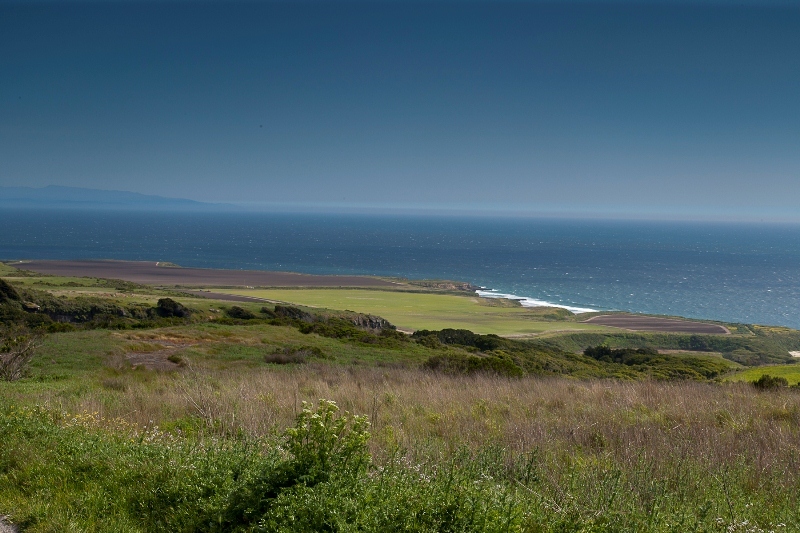 Along Coast Highway 1 and the Laguna estuary, woodland and winter-dormant plants thrive in rich, deep soil in the riparian corridor along Laguna Creek. Cold air settling in the winter makes this area inappropriate for succulents and South African plants that thrive elsewhere on the property. This first terrace is home to the River House and its distinct garden. Historically, the second terrace was devoted to agriculture. The main house, ranch compound, and their surrounding gardens are sited on the third terrace. The challenge was to integrate the buildings and garden gracefully into the site which was essentially a large, open, second-growth grass field. Previous owners had cleared the native marine chaparral of this flat upper terrace for farming and grazing livestock, leaving a mix of non-native grasses, poison oak, and thistles. The soil is dense and filled with clay—dig three to four feet down, and you could throw pots with the clay. Winter rains accumulate and further saturate the already heavy soil. A drainage ditch that once emptied into an adjacent quarry now diverts water into ponds that have become an integral part of the landscape. Not immediately seen from the entrance to the ranch, and discovered only by wandering downhill, the ponds have become an integral part of the landscape of the upper terrace gardens, evoking peaceful feelings that only still water can bring. John Greenlee, ornamental grass expert, author, and garden designer, began collaborating with Mills in 1993 designing an entry garden and creating large swathes of meadow along the drive. Mills recalls working alongside Greenlee to plant sedges (Carex sp.) right up until the day before her daughter got married on the property. Their challenge was to integrate the buildings and the landscape in a way that didn’t jar the eye or the soul. At a time when Australian plants were just being introduced in the California nursery trade, Greenlee’s design included several grevillea species and cultivars. 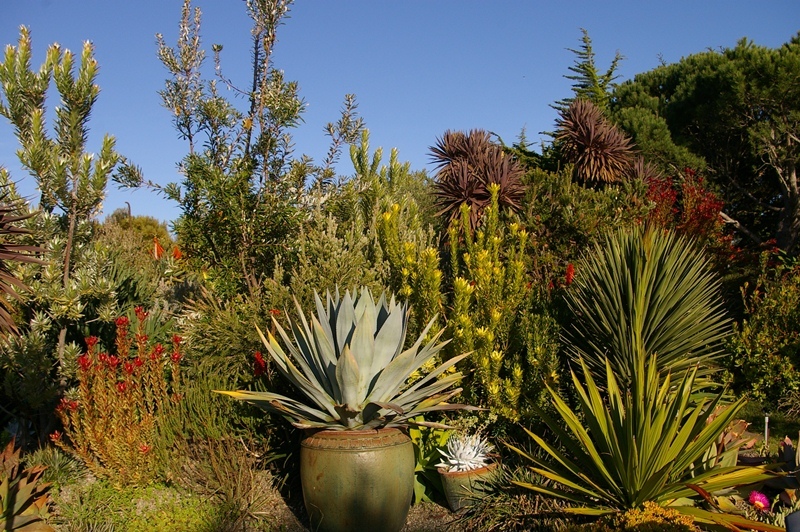 Providing inspiration and plants for the Mills garden, the University of California, Santa Cruz Arboretum, located just to the south of Laguna Ranch, was known for its extensive South African, Australian, and California native collections. Greenlee believed grevilleas, which were thriving in the Arboretum’s Australian collection, would also be successful in the garden if provided with proper drainage. Pink Watsonia, Achillea ‘Moonshine’, Verbascum ‘Artic Summer’, and a mix of orange Delospermum, mix with ornamental grasses and roses surrounding a pair of sculpted stone heads by artist Marcia Donahue. Following the meadow planting, Mills began to experiment with many new plants. Raised beds were added near the main residence where poor drainage continued to be a concern. Colorful plant tapestries of herbaceous and shrubby perennials were planted with roses and ornamental grasses accented with lilies and other bulbs for variety. Stone and ceramic sculptures added beauty and depth to the evolving gardens. Interior garden fences were installed for deer control and a perimeter fence was installed after feral pigs moved in from wild land adjacent to the property. Today voles and gophers have become the garden’s biggest pests; rabbits, raccoons, and rattlesnakes are live-trapped and moved to another area. The property is also home to hawks and weasels, as well as a number of mountain lions that roam the far reaches of the ranch—a reminder that outside the cultivation of the many gardens, nature continues in its wildest forms. 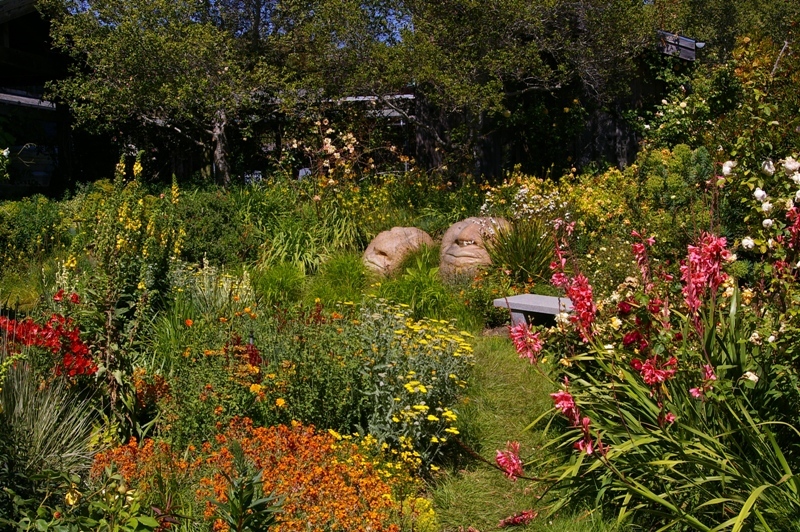 David Leroy, a garden designer from Santa Cruz, became involved with the creation of the Moon Garden at Laguna Ranch. Leroy, a former employee at Sierra Azul Nursery in Watsonville, met Mills, a frequent and valued customer, on one of her many buying trips to the nursery. Mills’ vision for the development of the gardens was that plantings be compatible with the history of the land and reflect its original use by indigenous people and Spanish California pioneers. In the 1990s, mature olive trees, relocated from land in the Central Valley slated for real estate development, were installed along the main driveway and in other parts of the gardens. The mature trees enhance the contemporary landscape and respectfully reference California’s past. Seduced by geometry, the Moon Garden and many of the gardens that followed are based on repeating circles, squares and lines. Plantings in the Orchard Garden are laid out in lines running parallel to the coast. The Teepee Garden consists of a maze of broken circles, while the Children’s Garden has parallel beds running at right angles to the orchard plantings, with circular elements throughout. Narrow, concentric circles planted with tightly matted grasses make up the Labyrinth Garden and a small village of circular willow huts graces the banks of one of the ponds. On the gentle slope above the main house, a large vegetable and cutting garden contains more than a dozen large, wooden raised beds. The garden, planned and planted for aesthetics as well as production, is filled with color and texture yielding visual delight in addition to a delicious harvest. A well-designed coop is home to Dominique chickens, who add daily doses of protein to the cornucopia. Although she had misgivings about the exposed, windy site Mills decided to try a dry garden on the west side of the main house. 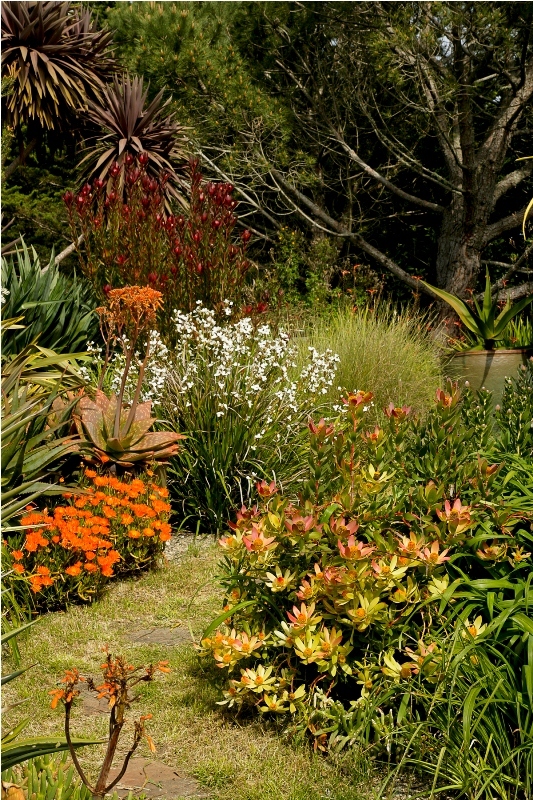 Better informed about winter conditions and drainage, elevated planting areas and terraced rock walls were established to accommodate succulents and other Australian and South African plantings. Despite early doubts, the garden is a success and dominated by agaves, aloes, cordylines and echeverias that are thriving on the windswept marine terrace. 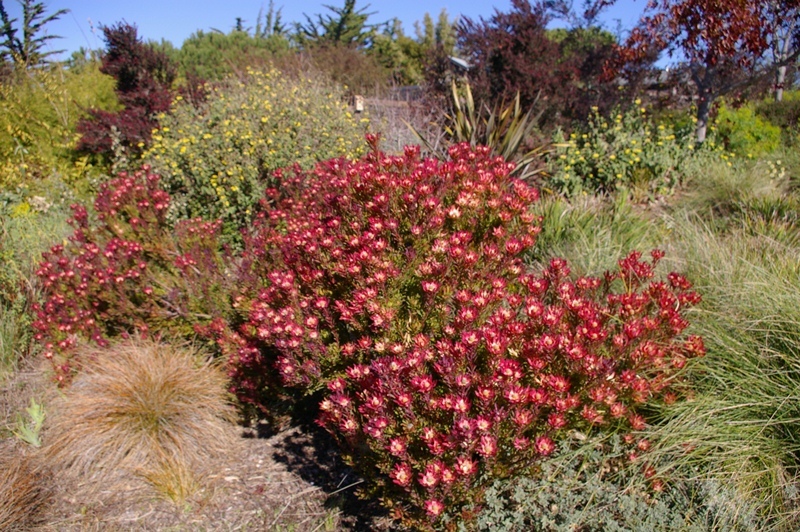 An adjacent planting area, initially the site of the family wedding, later a playground for her boys, today hosts a collection of flourishing Leucadendron and another succulent garden. Terraced rock walls are filled with stunning textural plant combinations. The most recent garden, the Zip Garden, looks like an outdoor camp playground, complete with a new pond and a white sandy beach. 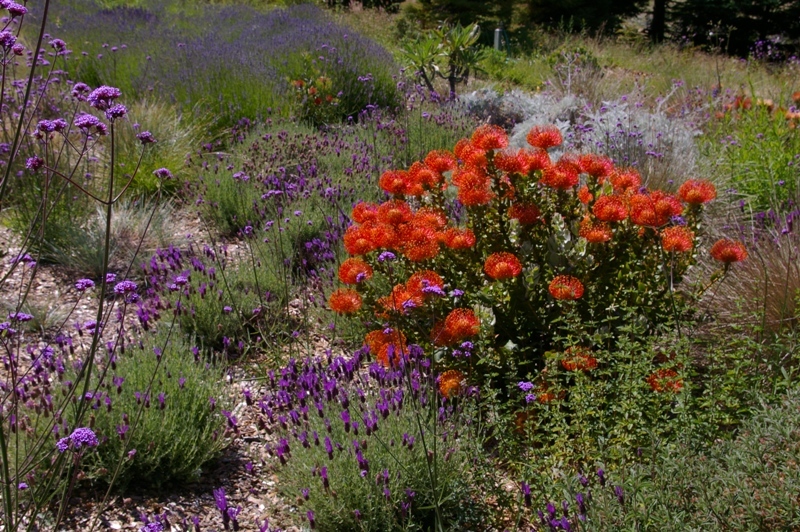 Plantings of California natives, South African and Australian proteaceae, tall ornamental grasses, and multiple curving rows of lavender surround the pond and large play structures. A towering zip-line races through the middle of the space flanked by a quirky climbing structure offering plant- and garden-lovers a break from visual stimulation with a jump into heart-pounding physical antics for an exhilarating way to complete a garden experience. John Farrell, former garden manager and instructor at the University of California Santa Cruz Farm and Garden, has been Laguna Ranch manager for 14 years. A good working relationship between John and Stephanie is a big factor in the success of the gardens at Laguna Ranch. Other gardeners join them as needed, especially when older gardens are being renovated and newer ones planted. Mills is inspired by what grows well and has a discerning eye for balance, adding and subtracting—mostly adding—to achieve her desired effect. She confides she tends to overplant. As the result of years of this hands-on approach, Laguna Ranch is a world-class garden very much grounded in place and history.